Considering that the Japanese Kanji letter meaning "Dream" is carved into a large, clear sculpture at the entrance to Honda's enormous historical museum near their Twin Ring Motegi Race Track facility near Tokyo, you got to figure the guy meant it. So when the very first generation Honda Accord went on sale on these shores, keep in mind that it was just less than a year before the era when Fleetwood Mac would rule the charts with its record simply titled "Rumours." And we all know that Honda has been the victim of many negative "rumors" in the automotive media regarding an allegedly subpar 2012 Civic and the widespread assumption that the 2014 Accord would be similarly disappointing. Now, the Accord was not the instant sales powerhouse in this country like that Fleetwood Mac album we spoke of earlier, but even in its infancy this family car always was always willing to "go its own way" to paraphrase the title of one of that albums biggest hits. Over the years the Accord stood as not always the most stylish looking family sedan choice but it was always the most involving to drive and felt the most like a true technological advancement as a piece of engineering. We are fortunate enough to have driven an Accord Plug-in Hybrid for a week, to have long term access to a V6 Sedan EX-L and to have also driven this model in coupe form both with automatic, CVT autos and six-speed manuals. If we must admit to our personal favorite, it would have to be a 6-speed manual transmission equipped two door coupe. But let's see if other models manage to excite. As with anything relating to the human eye, your reaction to the Accord will be pretty much a whole heartedly personal decision. But we personally love how Honda managed to make the car look lower, sportier yet somehow improved outward visibility by giving passengers especially in the rear an airier feeling cabin. Yet still, the Accord is a smaller sedan in many dimensions for 2014 externally but magically Honda managed to keep it just as roomy on the inside. Don't ask us how Honda did it, they just did. Our test vehicle also came with the Ivory leather seat trim but over the course of three months of testing with the regular presence of two 70 pound boxer dogs in the back seat, we can guarantee that interior materials do not show dirt or claw marks with this trim color choice. Clever use of contrasting interior plastic trim pieces not only make the leather upholstery look all the more upscale to the point of being Acura-esque but they also help keep the interior looking clean for a long time. Important to know when you plan on using this family sedan to haul around the messier (or furrier) members of your family. We don't judge if your kids turned out hairy. Despite a sizable drop in overall length enhancing overall maneuverability and agility, the 2014 Honda Accord somehow manages to offer a more than ample 15.8 cubic foot trunk as well as a nicely sized 17.2 gallon fuel tank that ensures long cruising distances on family road trips. And both the front and rear seats are truly designed for long mileage comfort, designed even to be especially easy for the installation and removal of baby car seats. Yes, they think of everything at Honda. First off, let's get the fuel economy numbers out of the way with all three new transmissions designed as part of Honda's Earth Dreams Technology powertrain systems, do manage to get the most out of miles per gallon especially in the real world where it counts. A 6-speed manual 185 horsepower (189 horses with the Sport model) 4-cylinder variant (LX, Sport and EX models) returns an EPA estimated 24 city/34 highway with the CVT automatic mated to the same engine returning 27 city/36 highway (available also with LX, Sport, EX, EX-L trims with or without navigation). Now for the fuel economy reading of our long term V6 tester equipped with the mandatory (on the sedan, the coupe is available with the manual and a V6) as the EPA estimates of 21 city/34 highway with our rather aggressively driven tester returning anywhere from 23-29 miles per gallon on average. That's amazing especially on regular gasoline and considering how fast this car is. 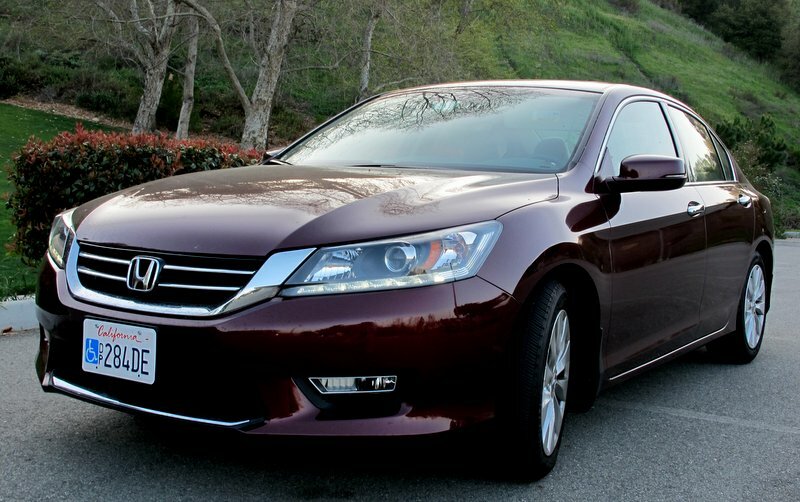 Pricing for the Accord starts at $21,680 for a nicely equipped LX model with standard dual zone climate control, Bluetooth, USB/iPod integration, 16-inch alloy wheels, Pandora capability, the easy to use Honda i-Mid infotainment system that debuted on the Civic, a 160-watt AM/FM/CD audio system and a back-up camera. What else do you need? More like what more do you want? Ordering a CVT or manual transmission adds nothing to the cost. Further up the line is the unique new Sport model with racy 18-inch alloy wheels, a more potent 189 horsepower 2.4 liter 4-cylinder engine, steering wheel mounted paddle shifters with the CVT auto, rear spoiler and body spoilers, fog lamps, power driver's seat all for $23,990. This model is directed at younger buyers and judging by the number of them around Southern California, Honda's marketing plan worked. EX trim adds more conservative 17-inch alloys, a power moonroof, push button start, keyless entry and the brilliant Honda Lane Watch which adds cameras on the passenger side mirror so when you signal right you can see all the vehicles two lanes over in your blind spot via a large center dash mounted screen. You can even press a button on the end of the turn signal an leave it on permanently. It works flawlessly and every car should have this feature. Not just every Honda. Every car. The EX is $24,605. Beyond this, you can move up to EX-L trim which adds leather interior upholstery, XM Radio, A-ha radio which hooks up to a number of useful podcasts and features via the Honda Link system. We tried once to listen to our Facebook feed (you can even "like" comments from our car) via HondaLink and it made us want to harm ourselves it was so annoying. Perhaps we need more interesting friends. But many can't be away from their social networking not even for a moment and Honda knows that. EX-L also gets you LED brake lamps, power passenger seat, a second dashboard touchscreen for HondaLink and various functions that all still manage to work intuitively. The EX-L trim is our favorite as it allows you to order Honda's excellent and easy to figure out in-dash nagivation system which you can manipulate via a simple rotating knob. Many journalists demand touch screen navigation screens to be the ultimate in high tech but there are many drivers out there with either medical conditions or Diet Coke addicitions that make it hard for them to hold their hands steady. If you have that problem, the Honda and Acura system gets around that issue brilliantly. The EX-L models also boast 3 view back-up cameras, LED front headlamps, 16-GB of built in audio memory, lane departure warning and a collision mitigation warning system. An EX-L navigation with the 4-cylinder stickers for $29,995 while our test 2014 Honda Accord V6 EX-L Navi model stickered for $32,070. A Touring model tops the range with a sticker of $33,430 and comes with high power LED headlamps and adaptive cruise control. As for safety, all you really need to know is that the 2014 Honda Accord sedan scored the highest possible ranking with the IIHS (Insurance Institute for Highway Safety) by being named a "Top Safety Pick Plus." This means the car was designed to not only hit other vehicles or a building but also a slimmer tree or pole which is the type of accident when most fatalities currently occur. The 2014 Civic sedan also scored this award. As for the driving experience, we found just as much joy to be found behind the wheel of a cloth upholstered yet agile 2014 Honda Accord Sport with a stick shift as this gearbox has a smooth and positive shift action with a clutch that rendered this car stall proof pretty much. This affordable four banger could be the fun mom or dad doesn't want the family to know they are having when they are driving the kids to the mall. But what about the CVT automatic and why do we usually hate them so much? CVT's are controlled by a pulley and are often times noisy as they tend to rev to redline and stay there making underpowered cars into true torture chambers. We are talking to you Nissan and Subaru. The CVT transmission also tends to let out a moan as you push it harder which could easily give you the impression that a cow hitched a ride in the trunk of your car. Yes, the noise CVT's often make is quite like a "moo" noise but somehow Honda created a CVT transmission (which helps improve efficiency) and afforded it a false step that makes the driver believe that the car is shifting like a normal transmission. There are no odd noises and no concerns about farm animals making a break for it in your trunk. Kudos to Honda, this is the best CVT ever built. As for our test 2014 Honda Accord V6 EX-L let's just say it is the drag racer of the bunch what with its telepathically smooth 6-speed automatic, 278 horsepower/252 lb. feet of torque Earth Dreams Technology direct injected V6 technology that emits the most intoxicating growl at high revs. Steering feel is best in class, body roll is kept in check and at cruising speeds this car rides and drives like the most serene limousine. 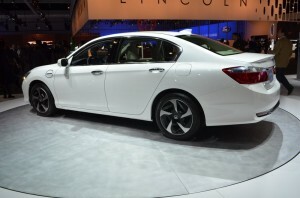 Class and fun are now the Accord sedan bywords most especially with the V6. 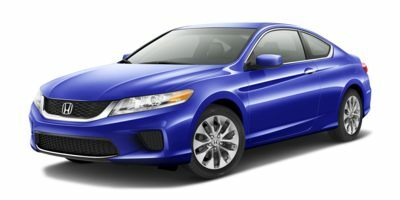 Last but not least is the Accord Plug-in hybrid which boasts about 141 engine horsepower and 55 horses from the battery. As it is an Accord, this plug-in is nimble, agile and fun to drive through traffic as it is so easy to cut and thrust into spots left by lollygagging commuters. All Plug-ins come fully loaded with navigation, Bluetooth, dual zone climate, plush button start, heated front and rear seats, adaptive cruise control, 17-inch alloys, backup camera, in dash navigation and much more for $39,780. All in all we came away just as impressed with the Accord Plug-in as we did with the Chevy Volt but if you regularly need seating for five and a proper trunk you should hit your Honda dealer. Now, you can't talk about a car like the Accord in a class as competitive as this without referencing the big three sellers which currently are the Toyota Camry which is excellent in V6 and Hybrid form yet feels a bit like a rental special with the 4-cylinder. The 2014 Nissan Altima is very impressive with its 3.5 liter V6 as it somehow quells all of the noise from the standard CVT auto although there is a severe porpoise-like, whaling motion from the suspension during spirited driving. Try it with the CVT and again it screams "Rent me." The only real competition for the Accord Plug-in is the Chevy Volt but that car is nowhere near as practical as the Honda. If you want something different, check out the 2014 VW Passat (the new 1.8 liter turbo is amazing) or the 2014 Kia Optima which is fun in base, turbo SX or even hybrid form so long as you don't leave the transmission in ECO mode which causes it to lose any sense of competency whatsoever. Or just play it safe and buy any of the aforementioned 2014 Honda Accord models. The Totally Un-CVT like CVT automatic transmission is an engineering marvel! The steering, handling and ride quality are a perfect blend of "fun to drive." 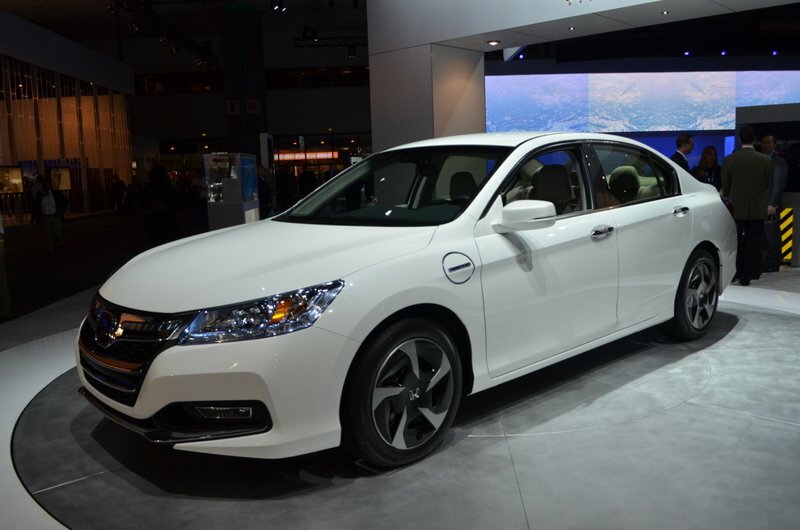 The Accord Plug-In Hybrid's Price! 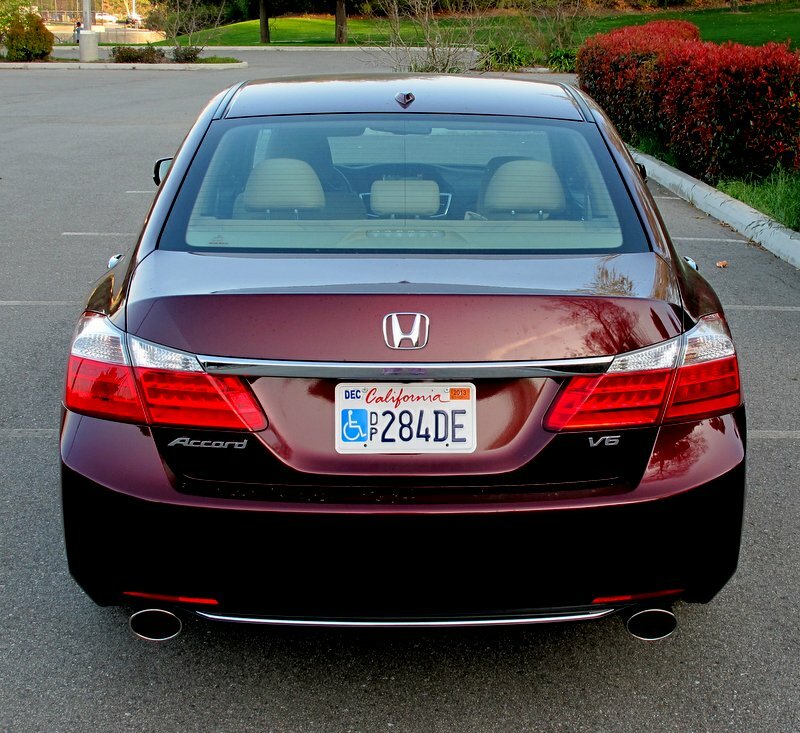 Interested to see how the 2014 Honda Accord ranks against similar cars in terms of key attributes? Here are the 2014 Honda Accord rankings for MPG, horsepower, torque, leg room, head room, shoulder room, hip room and so forth.